Blondie and Brownie: An Off-the-Radar Macaroni and Cheese Contest!! This past weekend, I spent the better part of Saturday in Williamsburg and Greenpoint; more later this week on the food and booze consumed (there was a lot of both.) During this Brooklyn adventure, this sign popped up in The Mark Bar. Mac and cheese off? 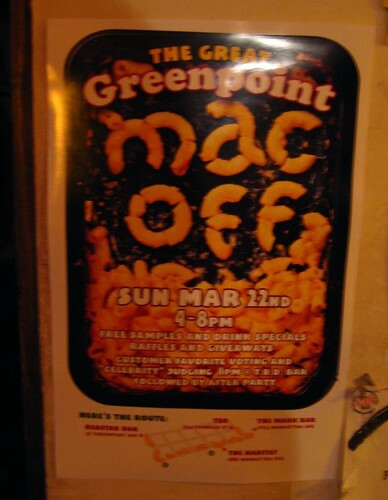 Mac and cheese off!! Apparently, this is not for the general public à la the Chili Takedown (or the upcoming Bacon Takedown!) It appears that they will be comparing the mac and cheese offerings from four neighborhood places. This contest begins Sunday, March 22nd at 4pm in Red Star before continuing on to The Habitat, The Mark Bar, and t.b.d.. May the best bar mac and cheese win!! 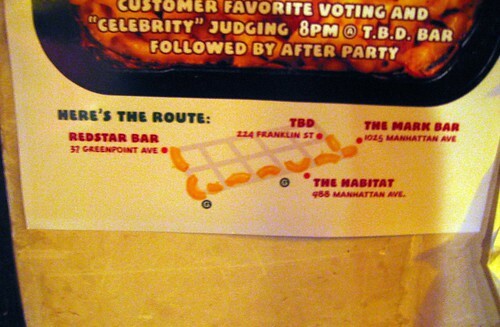 988 Manhattan Avenue, near Huron St.
1025 Manhattan Avenue, near Green St.
Who is the winner ?? I am sure I am not the only one outside of this age range that enjoys a box of macaroni and cheese every once in awhile. It was one of my favorite foods. I loved the instant macaroni and cheese made by venerable Kraft Dinner. On Friday we’re going to have a little cooking contest in our locality.